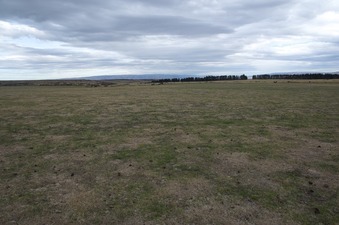 18-Feb-2015 -- While on vacation in the Queenstown area, I took a detour (about 1.5 hours driving each-way from Queenstown) to visit this easy Degree Confluence point, which lies in the middle of a large farm field, just 800 m from a paved road. From the road, I first climbed over a short fence into a sheep farm (with several sheep present). Then over a larger fence - near a pine-tree windbreak - into a large, flat field (that had no animals grazing). The confluence point is in the middle of this field. A white rock - clearly out of place in this field - had been placed by an earlier visitor to mark the point. This part of New Zealand - about as far as you can get from the ocean - feels more ‘continental’ than part of an island. This area - with its brownish vegetation and large flat fields - looked a lot like parts of western North America. Even the windbreak - to the northwest of the confluence point - was made from exotic (to New Zealand) pine trees.